The Heritage Trail Patagonian Andes - Lake Palena, located in one of the most isolated and topographically complex geographical areas in Chile, represents a unique opportunity for lovers of long-range horseback excursions to retrace the paths traveled by the pioneer settlers of yesteryear in their incursions up the inland valleys of the El Tigre and El Azul Rivers. 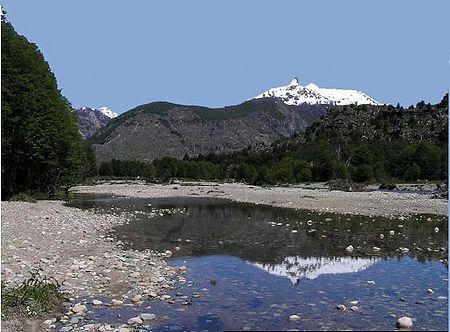 This route combines views of exceptional landscape, environmental education, observations of native flora, visits to places occupied in the past and the discovery of one of the most beautiful areas of the Patagonian region of Chile: Lake Palena and the surrounding mountains covered with placid deciduous forests made up primarily of lenga trees (Nothofagus pumilio). This trail covers 33 kilometers that can be traveled by horseback to gain access to the Lago Palena National Nature Reserve, a little explored wildlife area that because of its beauty and pristine state is representative of how the landscape was in all of these inland valleys in the recent past. Without a doubt, those who visit this interesting route will have reason to meditate about our role throughout history concerning our exploitation of natural resources and its effect on the landscape. The Patagonian Andes Lake Palena Heritage Trail runs through a large part of the valleys of the El Tigre and El Azul Rivers until reaching little-known Lake Palena located to the south. The trail stars at only 7.8 kilometers south of the town plaza of the town of Palena in the Municipal District of Palena, situated at the southwestern end of Chile Region 10 (the Los Lagos Region). On the east, the area covered by the trail bounds with the mountains of the rich California valley, and on the west with an exuberant cordillera of snowcapped mountains that separates this area from the El Tranquilo River. Best visited during the months of december to march. The shortness of the season is due to the ammount of snow in the hight parts of the treks (third segment). Accessing the trail from the north is made by taking the way out of the town to the south from Palena, starting from the town plaza and traveling over Hurtado de Mendoza and Luis Marchant Streets, then continuing onward along the motor vehicle road in good condition that runs toward the town of El Tigre. At kilometer 3 on this road, take the road to the south that runs parallel to the El Tigre River, turning off at an information sign that has general information on the route. Go on another 3 kilometers until you reach the end of the motor road at a point next to a stream where Guidepost 1 is located to mark the start of this heritage trail. The trail, which is divided into three separate sections, has 35 georeferenced guideposts to facilitate the orientation and understanding of visitors. The guidepost signs are placed on posts of coihue, ñire and lenga wood 1.5 meters high posted alongside the trail. The distance between guideposts is variable, depending on the thematic characteristics featured at each point of interest, the necessary directions to be given along the way, and fords to cross over the river. In any event, distances between any two guideposts are never more than 2 kilometers. Additionally, 26 trail markers are used as an aid to indicate the path to take from Guidepost 30 onward in forested areas that have restricted line-of-sight visibility. This heritage route starts just south of the town of Palena, located at the south end of the Province of Palena. Section 1 starts at the existing end of the motor vehicle road that is to link Palena with the settled locality of El Azul in the future and is to end at that locality. This section covers a distance of approximately 10 kilometers on a clearly distinct and marked trail with 10 guidepost of interest located along the way.These guideposts are primarily located at sites that feature exceptional views of the landscape, observations of native flora (such as notro and radal trees and regrowth stands of coihue trees) and views of the typical buildings inhabited by those who make these isolated valleys their permanent home. Also provided is a chance to have a sobering look at the effects caused by wildfires set in the past. This is an ideal trail section to be traveled on foot on a one-day excursion or a half-days journey on horseback. Section 2 extends onward from Guidepost 10, located at the first crossing over the El Azul River, until reaching an old campsite formerly used by drovers of cattle in what was locally called veranadas, or summer grazing season, driving their herds upland from the low lying portions of the valley every year. This section is approximately 14 kilometers long and runs over a clearly distinct and marked trail that has 15 guideposts of interest. The route in this section travels on and off along the eastern and western banks of the El Azul River. This requires crossing the mainstream six times along the way, an extraordinary experience that takes us back to the days of those who explored these valleys for the very first time on long treks on horseback in the middle of the Twentieth Century. It is to be noted that this second section of the trail is where you can also begin to see the snow covered upland cordilleras of the Andes Mountainsrising up to more than 2000 meters above sea level (m a.s.l.). You can also view the first specimens of ñire and lenga, both species belonging to the Fagaceae, or beech family of trees, primary representatives of the temperate forests of deciduous trees (trees that shed their leaves each winter) that are so characteristic of these far southern latitudes of the Southern Hemisphere. This is an ideal section to be traveled in leisurely fashion on horseback, giving yourself time to take the traditional siestada, or midday rest break and lunch (see below under Section 3), and numerous photographs of the surroundings. Section 3, the final section of this trail, extends from Guidepost 25 onward until you reach the lakeshores of Lake Palena. It includes 10 guideposts of interest featuring primarily overlooks that afford panoramic views and observations of the native flora that inhabit the Andean upland forests. This section runs over approximately 9 kilometers of traces that are not always sufficiently well marked or visible because of the few travelers that take this way. We recommend you travel this section by horseback only due to the extenuating effort required to climb the upgrade in this section. This ascent takes you across a mountain chain at elevations of more than 1300 m a.s.l. separating Lake Palena from the upper watershed of the El Azul River. 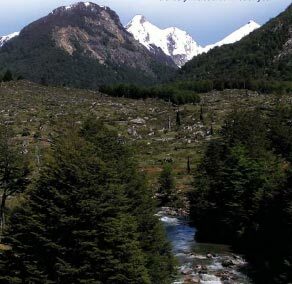 Horseback ride or walk through meadows on upper river terraces with regrowth stands of radal, coihue and notro trees on the eastern slopes of the El Tigre River valley. Also featured are views of homestead sites occupied in the past, observation opportunities for typical settlers buildings and native flora, and natural overlooks with vistas of the main valley and surrounding mountains. Route traveling over a distinctly visible trail on a traveled way broader than 2 meters on firm, flat, gently sloping ground, interspersed with short upgrades sloping more than 30º. Section 1 is suitable for travel on horseback, or, if walked on foot, by traveling light without carrying any extra load. Section 1 of the trail starts at the south end of the motor vehicle road beside the beautiful, torrential streamflow of the El Tigre River. The path to follow on this section is distinctly visible because it is frequently traveled by persons and livestock, which leaves no doubt about the path to follow. In general, the route you are about to travel runs on a southerly bearing, with short upgrades here and there as you make your way upstream along the steep banks of the El Tigre River, a factor to be considered for those who wish to travel this section on foot. Remember, the typical travel times are calculated for those who travel on horseback. Starting at Guidepost 1, follow the broad, clearly distinguishable trail for around 250 meters south until you reach a fork in the trail. Take the left fork. Keep in mind that the next 700 meters of travel are all uphill to climb up one of the side valleys on the eastern side of the river valley. In this area you will be continually surrounded by growths of radal and notro trees, quila undergrowth and coihue saplings. The trail here runs along a gradual ascent and moves away from the El Tigre River, but with partial vistas of the river at certain points. After you reach the top, you will enter a woods of coihue (Nothofagus dombeyi) trees associated with a stream, and thus you will soon hear the gurgling sound of flowing water. You are now at the location of Guidepost 2, named Estero de los Coihues (Coihue Stream). This is an ideal spot to have a good look at this interesting species of tree, accompanied by ferns belonging to the Blechnaceae family, locally called peinetilla. The coihue is a tree that is endemic to sub-Antarctic forests and requires soil having considerable moisture content for its development. This is a tree with dense, stratified foliage made up of persistent leaves with serrate edges. It grows as tall as 40 meters high, and its wood is resistant to rot, making it good for use as building material. After Guidepost 2 you will go downhill and cross a creek. Continue onward until you reach a farm gate just after crossing another small stream. Go through the gate, and do not forget to leave the gate in the same position you found it, either open or closed, before moving on. It is important for you to do the same each time you come to a gate along the way. Stay on the main trail and skirt the west side of an old pioneer settler dwelling site as you continue on. This is an interesting area of rolling relief features covered by a beautiful mature forest.The land features are reminiscent of lateral moraine deposits left by glaciers of time past, which shaped landforms through the action of their large masses of glacial ice. In less than 10 minutes travel you will arrive at an open valley in which you will see a second farm gate, which is located nearby Guidepost 3. This is an ideal site to observe one of the most abundant species in the area: the musk rose (Rosa moschata - locally known as rosa mosqueta). The rosa mosqueta is a denizen species that can be found on disturbed land and along the wayside of roads and paths from Region 5 in central Chile on down to Region 12 at the southern tip of the country. It is a deciduous shrub that grows as tall as 2.5 meters. It has pink flowers and orange colored rose hips that ripen in autumn. These rose hips are used to make jellies and jams and to extract medicinal oil. Following the trail onward past Guidepost 3, you will start out on a long stretch through open meadows interspersed with abandoned logs of coihue trees felled by loggers, which remain as a mute memorial to the time when this area was covered by dense forests. At the southern end of this meadow you will find Guidepost 4 on flat ground a short distance away from the east bank of the El Tigre River. This is a very good site for those who wish to go down to the mainstream of the river and admire the beauty of its transparent water flowing down the valley. Having a look at the river will also provide you a short rest break before you continue on along the trail. After Guidepost 4 you will come to an upgrade of 250 meters in length that will take you up to the upper river terrace. This latter area features open meadows over a length of 1 kilometer aligned in a north-south direction that have abundant felled logs lying about. This terrace is approximately 40 meters higher than the present level of the mainstream of the river. Once you are on the terrace you will be able to see the following guidepost in the distance, off to the left of a large white rock in front of you. Guidepost 5, emplaced on a small elevation, is at a representative location to show how important it is to practice sustainable soil management if forests are removed. It is to be noted that the low amounts of organic matter and nutrients in these soils of volcanic origin, combined with the fact that they have been overgrazed by extensive livestock raising, now make it necessary to carry out clearing and upgrading programs to remediate these soils. Before continuing on along your way, take a moment to locate the following guidepost, which can be seen off to the southeast. After a few minutes travel you will come to a farm gate. Go through the gate, and after you are on the other side have a look at a beautiful settlement on the banks of the El Tigre River off to the west. From this point on you will go uphill continually through land with regrowth of radal and notro trees, with possibilities to see a berry bush locally called murtilla in the lowest canopy of the woods. After going uphill by no more than 50 meters in elevation you will arrive at Guidepost 6, at a locality called Cuesta La Greda (Clay Upgrade), named for the fine-grained grayish materials originated from volcanic ash that make up these soils. To be seen at this location are vistas of the El Tigre River and radal trees, which along with the coihue is one of the most abundant species in these valleys. The radal (Lomatia hirsuta) is a perennial tree that can grow as tall as 15 meters high. Tree trunks have thin, grayish bark. The leaves are large and oval shaped and bear numerous bunches of cream-colored flowers. Radal wood is much appreciated for use in furniture making, and the bark of the radal is used to obtain brown dye. Radal leaves are used in medicinal baths to assuage pains in the joints. At present, the major fuelwood supplied in Palena is radal wood due to its high heating value. Finally, be particularly careful not to light fires anywhere along unpopulated portions of the route. You will need to continue on past Guidepost 6 for approximately another 10 minutes over open, elevated ground throughout all of this clearly apparent stretch of trail until you see the following guidepost in the distance. You will cross four small streams along the way, where you can replenish your water supply. On your right you can see what are locally called puestos viejos, a term used to denote old homestead sites that today often have nothing more to show for themselves than a few lingering fruit trees. Shortly thereafter you will travel over a small upgrade until you reach the locality of Cruce de los Riscos (Cliff Crossing) where you will find a farm gate and Guidepost 7. It is important in this area not to stray from the main trail because the El Tigre runs through a large canyon, and so areas lying off the established path can be dangerous. Once you have resumed your journey past Guidepost 7, you will continue climbing uphill on a rocky trail running between rocky hillsides on either side and regrowth stands of the same species of trees as you have seen before along the way. After traveling around 800 meters from the last guidepost you will reach the top of the upgrade, where you will have one of the first panoramic vistas of the El Azul River valley. In less than 10 minutes travel you will finally arrive at one of the most interesting overlooks on this route, which is the place where Guidepost 8 is located. At this overlook you can see the El Azul River where it meets the El Tigre River, which has its headwaters in the valleys that extend eastward to the Argentinean border. It is important to note that the El Azul River valley was not explored until the 1940s, a time when it was completely covered with lush mature forests of coihue, ñire and lenga trees. Early explorers entered the area by moving up the banks of the El Tigre River. A few years later, wildfires were set to clear land for use for livestock grazing. The thinking at the time was that this was good for furthering the process of bringing in settlers to this part of Chile. Complete families moved in shortly thereafter, and an airstrip was even built for connection by air. This was the heyday of livestock raising in the area, a period which was to last for no more than 40 years. After Guidepost 8 you will start down a downgrade named Cuesta Caracoles. Take your time and move carefully when descending this downgrade because the trail is very steep and rocky in certain parts. At the end of this downgrade you will come to a farm gate on the way to a footbridge over the El Tigre River, where you will find Guidepost 9. Guidepost 9 is an interesting point to take pictures of the El Tigre River, the confluence with the El Azul River and the footbridge over the river. A pioneer explorer of these parts more than 50 years ago, José Casanova, axe in hand, was the first to build a footbridge on this site. A veritable historic heritage item along the rivers of the far south of Chile, footbridges such as these were the only existing links to communicate Palena with Lago Verde Lake (Region 11) through the rugged country on the Chilean side of the international border with Argentina. After leaving this beautiful footbridge, resume your journey along the trail on a descent of another 250 meters until you reach the lower level of the El Azul River valley. From there, continue onward another 600 meters along a clearly visible trail until you reach a fork in the trail. Take the right fork and go on along a less distinctly visible trail until you pass by a small stream and a pioneer settler dwelling and finally reach the El Azul River, where Guidepost 10 and the end of Section 1 of the trail are located. Those who have made the first part of this trek on foot should keep in mind that the El Azul River is not safe to cross on foot at this point. If you want to continue on any further beyond this point you will definitely need to have horses to ride on. Horseback ride through meadows on lower river terraces with regrowth stands of radal, coihue, ñire and lenga trees in the background in the valley of the El Azul River. Views of homestead sites occupied in times past, observation opportunities for native flora, and natural overlooks in the upper watershed of the El Azul River. Route follows a distinct, marked trail on flat ground that at certain points is washed over when running over streambeds. Suitable for use only by persons on horseback who have at least a minimum amount of experience in lengthy mounted excursions over land with river crossings. Starting out from Guidepost 10, cross the river a few meters downstream from this guidepost by moving on a generally southerly bearing. Face the current (upstream) and move diagonally against the current as you ford the river. Seek out the shallowest parts (locally named vados de río) as you cross, and keep your gaze high enough so you can keep in sight the point on opposite bank where you want to arrive. 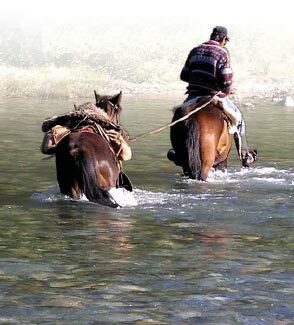 Fording like this is locally called vadear el río. This technique is generally applicable for fording rivers such as these, which sometimes have currents that can even take experienced scouts or gauchos by surprise. If you are not traveling with local guides, enquire beforehand with well informed persons about the streamflow and water stage conditions on the river because at times of heavy rainfall or thaws that generate large amounts of meltwater runoff, the El Azul River can turn hazardous and impossible to cross, even on horseback. This can be particularly so in the afternoon. After you arrive on the south bank of the El Azul River, follow the edge of the river upstream using the main trail all along the way until you reach the community center building (sede comunitaria) of the village of El Azul, where Guidepost 11 is located. At this point, radio communications with Palena are available on radio equipment operated by the inhabitants of the village themselves for use in case of emergency. After passing Guidepost 11, continue onward along the main trail running parallel to the El Azul River. After a short way you will see on your right one of the first houses built in this valley. You will note that the old-time pioneers always wound up building their houses on the upper terraces of valleys to stay high and dry in case of flooding on these rivers. Continuing on along the western bank of the main river you will come to a fork in the trail. Take the left fork, and a few meters ahead you will see Guidepost 12, located at the second ford over the El Azul River. Observe the same precautions and recommendations given above for the first river crossing. After you have reached the eastern bank of the river, resume a southerly bearing along the clearly distinguishable trail, which runs between a fence and the mainstream of the river, until you arrive at Guidepost 13, located at the site of an alternate river ford where you can cross over the other side to go to a family dwelling that offers lodging if you want to stay the night. For those who want to go to this family inn, we recommend, however, that instead of crossing the river you continue on upstream from Guidepost 12 on that same side of the river for somewhat less than 1 kilometer from that guidepost until you run across this picturesque lodging house. When you continue your journey onward from Guidepost 13, follow the valley for a short distance along the river across flat ground of an open meadow that has stony parts left from old riverbeds until you finally reach Guidepost 14 near a farm gate. This location is called Rincón de la Cabaña (Cabin Corner) due to the existence of a cabin on the south end of this broad expanse of flat ground. This is a place where you will need to take care to ensure that you stay on the right path. After you go through the farm gate, travel onward by taking the path that leads to the right and runs parallel to the fence, where you will soon find a small woods of tall coihue trees a few meters west of this cabin at a place where you will once again be facing the main river. There you will find Guidepost 15, which is the start of a part of the trail that runs along the eastern bank of the El Azul River without having to cross the river. A noteworthy point to be mentioned about this location is the large poplar trees and fruit trees standing on the opposite side of the river, signs of it being the site of a family homestead in the past. This is the reason why this place is locally called Puesto Viejo (Old Homestead Site). After Guidepost 15, follow alongside the river and pass by a wooden fence inside a beautiful woods. On the other side you will find a meadow with felled tree logs until you reach Guidepost 16 shortly thereafter. Looking south from this guidepost you can see a large house of local settlers. At this point you can see how the regrowth stands of coihue trees on the opposite hillsides have reestablished themselves vigorously in the period after the large forest fires that raged in the past. At Guidepost 16 the trail forks. Take the right fork and follow the trace that runs between the fence and the river over land dominated by growths of shrubs such as chaura, murtilla and michay, with dispersed stands of young notro, radal and coihue trees. On the far south side of the end of the valley you will find Guidepost 17, where you can see the first specimens of lenga (Nothofagus pumilio) trees along the way. 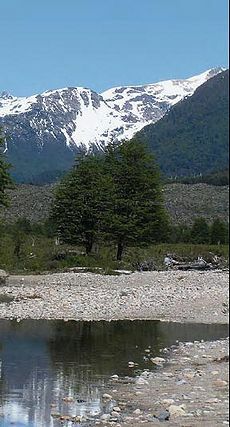 The lenga is a symbolic tree of sub-Antarctic forests, growing from Andean cordillera portions of the Maule region (Chile Region 7) until the seashores of Tierra del Fuego Island. It is a deciduous tree that grows to as tall as 30 meters with a trunk measuring more than 1 meter in diameter at breast height. This tree can withstand snowstorms, heavy winds and extremely cold frosting, which makes it the unique representative tree at locations near the timberline in the Andes at these far southern latitudes. Lenga wood is of very good quality, especially for use in building and furniture making. After you leave Guidepost 17 behind you will start out on a gentle upgrade for around 100 meters and enter an area of abundant regrowth stands of radal trees. You will need to be careful about staying on the right path in this area because at certain points you could lose your way if you are not careful: you will need to travel on a generally southeast bearing until you reach a fork in the trail. Take the left fork, which will lead you over a new trail running uphill that was made to skirt around rocky areas. Once you reach the highest part of the trail you will see the following guidepost, with only 400 meters remaining at that point to reach it. Guidepost 18 is named Bardas Blancas (White Bluffs) for the numerous grayish rock cliffs located on both sides of the valley. This is an ideal spot to gaze at the beautiful virgin forests of coihue and lenga trees in the southwestern sub-basins of the El Azul River. After you pass Guidepost 18, continue onward for somewhat more than 100 meters until you reach a new fork in the trail. Take the left fork, which will shortly lead you along the edge of a small lake. Continuing onward on the main trail you will have a few vistas of the river as you go downslope until you once again reach the banks of the main river after a few minutes. Keep traveling on a southerly bearing through a broad expanse of flat ground with a dense cover of notro trees until you reach the north bank of the river. This is the location of Guidepost 19, which marks the way for the third crossing over the El Azul River. If you look closely at the opposite bank of the river directly south of where you are standing you may be able to spot Guidepost 20, located at a place called Puesto El Manzano, the site of an old cabin that has fallen in with the passage of time at a place beside a willow tree and woods of lenga trees. After leaving Guidepost 20 you will need to continue following the edge of the river upstream for somewhat more than 100 meters and then ascend to the high part of the hillside. After you continue onward on the main trail for a few minutes more you will soon start out on a gently descending portion that will take you to a small valley by skirting around the rocky hillsides that you will see on your right side. Continue onward until you reach Guidepost 21, located at the start of the fourth crossing of the El Azul River. To ford across the river at this point, take a bearing on some lenga trees located on the opposite bank as you work your way diagonally upstream across the river. Once you reach the opposite bank, go on for 150 meters in a southeasterly direction until you cross a creek. At that point you will be able to see a small cabin located a few meters to the east. This place is called Puesto Esperanza. After crossing the creek, continue onward up the valley on a trail running parallel to the river over open ground covered with low stands of weed growth until you soon come to a fence. At the fence, turn to the east for a few meters and you will find a farm gate, which is the location of Guidepost 22. At the other side of the gate you will enter the first mature forests of lenga trees that you will see in the El Azul River valley. Go on for around 900 meters on a southerly bearing over a distinctly visible trail until you reach a crossing point over a small stream. You will now start to travel over stony ground that is a part of the far eastern side of the El Azul riverbed. Continue onward over this ground for another 300 meters alongside the river over a stretch with the first views of the mountains of the upper watershed. Continue onward over a lower river terrace covered by a dense colony of calafate undergrowth interspersed with stands of quila brush. Looking to the east while on this flatland you will be able to see a large waterfall, and looking to the south you will see Guidepost 23, located at the fifth and second-to-last crossing of the El Azul River. This guidepost, besides pointing out to you the place to ford the river, also marks an opportunity to observe calafate (Berberis microphylla) growths. The calafate, a species of shrub belonging to the Berberidaceae family of plants, grows from the Maule Region (Chile Region 7) southward to Magallanes (Chile Region 12) on wet soils with poor drainage. It bears single flowers that are golden yellow, and its fruit, a round blue-black berry, is edible. The medicinal uses of this shrub stem from its laxative properties. After you cross the river, you will once again enter the lenga forest on a narrow, but clearly distinct, trail running parallel to the river until you arrive once again at the north bank of the main river. At this location you can see Guidepost 24, which marks the sixth and last crossing of the El Azul river, at a location next to large lenga and ñire trees. It is to be noted that this is the area of the confluence of the El Azul River with an unnamed river, which you will skirt around further ahead as the upper watershed of the main river curves to the west. Numerous individuals of caiquén (Chloephaga picta), a bird that inhabits primarily open ground, are habitués of this part of the river. Their heads and backs are white with black bars. The males can be distinguished by their being lighter in color on their upper parts and darker on their lower side. Once you arrive on the south bank of the river, continue upstream along the bank of this river of clear water to no more than 100 meters from the last crossing until you reach a farm gate that is the entrance to a forest of lenga trees. From this farm gate on, only 150 meters of trail remain to be traveled in a southeasterly direction through the mature forest until you reach the last settlement located on this route prior to reaching Lake Palena. This is Guidepost 25, the end of the Section 2 of the trail. Walking Time: 3 hr. 10 min. Horseback ride through Andean upland meadows, marshy grasslands and forests of lenga trees in the upper watershed of the El Azul River and northwestern end of Lake Palena. Observation opportunities for native flora and natural overlooks with vistas of the main valley, surrounding mountains and Lake Palena. Travel over firm ground on a trail that follows a distinctly visible trace, although vanishing from sight in certain parts. Slopes are gentle to steeply inclined, with lengthy upgrades that slope more steeply than 30º. Suitable only for persons who have experience with lengthy excursions on horseback through mountains in areas exposed to high winds. Starting at Guidepost 25, leave the forest by traveling southward through a meadow covered with calafate growth. Take your bearings on a farm gate located around 600 meters to the south. Once you reach the following creek, a watercourse that flows down from the high watershed of the main valley, turn to the east and continue along the trail. Do not cross the creek. Be careful to keep your bearings upon traveling over the following stretch of trail as you move upstream along the creek in a southeasterly direction because the trail disappears suddenly along the way. So, go due south around 100 meters and then start going uphill along the slope of a hillside. From there, calculate another 500 meters until you reach Guidepost 26. This is the area where the creek from the waterfall meets the watercourse coming in from the upper watershed. It is also the last place before you start out on the route that takes you across the mountains that provides good shelter from the winds and snows that blow through the valley because it is associated with sheltering woods of lenga trees. This is a site where you can also observe the waterfall and surrounding mountains. Continuing onward from Guidepost 26, go uphill along the fence running up the hillside until the fence ends. This is the start of an upgrade running parallel to the creek, which you can see to your right. In this area, the trail vanishes from sight once again. Try to bear gradually to the southeast by traveling in a zigzag fashion until you cross above the waterfall on the north side of it. Move away from the waterfall a little bit until you cross a small brook in the high part. This is where you will find Guidepost 27, located beside a fence. Guidepost 27 is perhaps one of the best vantage points for viewing the El Azul River and its associated watershed. 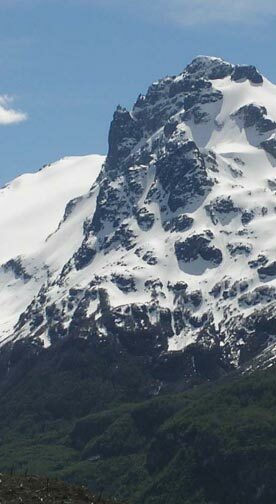 Again, the dominant landform that meets the eye of the viewer is the cordillera of the Andes Mountains, covered with a dense virgin forests that stand in contrast with the barrenness of the valleys and hillsides that were leveled by wildfires, making for one of the most desolate landscapes one can see in all of Patagonia. Of interest to note is the glacial origin of these valleys, where you can identify characteristic U-shaped landforms, made with cirques, troughs and shoulders, in the upper valley of the El Azul River. We recommend you make a brief halt here before you resume your ascent of the mountains. After you leave Guidepost 27, continue climbing up the hillside by skirting along the north side of the lenga forests located nearby. Move in zigzag fashion to follow a general bearing to the southeast. A short while after you start out you will arrive at the lower edge of the forest, where you will need to continue onward by following a clearly distinguishable trail that enters a mature forest of lenga trees. This is the location of Guidepost 28. Noteworthy at Guidepost 28 is the opportunity to observe a characteristic lichen of upper montane deciduous forests in the far south of South America locally called barbilla, barba de viejo, barba del diablo or barba del monte for its bearded aspect (Usnea barbata). This is an epiphyte that makes use of its host tree for support only and does not cause any damage to the host. This lichen has antibiotic properties and was traditionally used as a dyestuff. Moving on from Guidepost 28, enter the forest by following a clearly distinct trail. This will take you along a beautiful route through an area with old-growth lenga trees, accompanied by an extremely rich variety of species of nature in the lower canopy and understory. You can keep track of your progress by counting the small stream crossings encountered along the way, which are no more than three in number, until you reach a small gap in the forest. You have arrived at a place locally called Primer Portezuelo, and area of marshy grasslands of hard grasses devoid of trees. These wetlands are the headwaters of the main creeks running out of the area. Cross this gap by moving forward around 100 meters on a bearing to the south over ground without any trail until you arrive once again at the forest edge. Here you will find the traces of a trail that will take you into the forest. This is the location of Guidepost 29. After you leave Guidepost 29, follow the trail around 130 meters to where you cross the stream that has the waterfall located on it. As you continue on along this route, you will emerge from the forest once again and move into a large expanse of marshy grasslands. This is the location for Guidepost 30. We recommend you take a brief rest break at this guidepost, where you can also give the horses a chance to graze. It is also possible here to enjoy a tradition locally known as a siestada, a customary break that people take at midday in Patagonia to eat roast meat and bread or cake and sip yerba mate while sharing pleasant conversation around the fire. Before resuming your journey from Guidepost 30, have a look at the lowest part of the mountain chain located to the south-southwest where you can spot the following guidepost, located at the start of the mountain pass that will take you over the mountains to Lake Palena. After leaving Guidepost 30, continue onward for around 400 meters through these trackless natural meadows until you enter the forest of lenga trees once again. Take your bearings on Guidepost 31 to know the path to follow, aided by a few trail markers placed on trees along the way. Once you are in the forest, you will start out on a steep uphill climb over a clearly distinct trail for about 300 meters until your reach the upper edge of the forest, where you can see Guidepost 31. This point marks the start of an area with open ground and moist grassland and rocks, typical of high-montane environments in periglacial settings, with limited growths of vegetation and a continual interplay with the activity of ice. When leaving Guidepost 31 behind, go on for a few meters to the southwest, and you will soon see the next guidepost. Take the utmost care to stay on course as you pass Guidepost 32 and enter a flatter section of ground. There is no trace of the trail in this area, and many people could make the mistake of traveling to the west, which leads to nowhere. Continuing on past Guidepost 32, take a bearing of 158º using as a reference the western edge of a small mountain peak covered with stunted coihue growth. From this last milestone continue on for around 400 meters over flat ground where the trail is not distinguishable. Pass by a small lake until you reach a larger lake that you can see on your right hand side. From the time you find this last lake, bear gradually to the southeast by following the rocky hillside that will be on your left. After you leave the lake behind, a few meters ahead you will be able to see Guidepost 33 on a small rocky piece of elevated ground. This is an exceptional overlook for viewing a large part of the main peaks associated with this nature reserve. It is also the place to finally have the first panoramic vistas of Lake Palena, one of the most spectacular lakes in all of Patagonia, nestled in a dense forest made up for the most part of lenga trees. In general, this site is considerably exposed to cold winds blowing down from the cordillera, and therefore we recommend that you protect yourself with windproof, thermal clothing to prevent symptoms of hypothermia or freezing. After you leave Guidepost 33 you will start on the downhill trail leading to Lake Palena.You can keep your bearings by taking a sighting on the east end of the lake, which runs parallel to a small creek that flows in a southeasterly direction until it finally outfalls to a broad, open area with marshy grasslands. 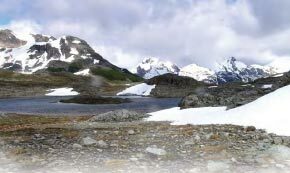 You will need to take into account the fact that in the part of the trail extending from the last guidepost onward to this grassland large snowpacks may accumulate annually and remain on the ground on account of this being land that has southerly exposure. We therefore recommend you take the utmost of precautions and move carefully when traveling downhill. You will need to travel around 250 meters un a south-by-southwesterly direction over this open expanse of ground until you find the entrance to the woods, where a clearly distinguishable trail is located.This is the site of Guidepost 34. Moving on from Guidepost 34, the only part left to travel is the final descent through an interesting mature forest of lenga trees in which Lake Palena will appear to you nearer and nearer as you approach the end of the trail. It is to be noted that this is a descent over hard clayey ground with steep slopes that in places can be difficult for pack animal to negotiate. We therefore recommend that after you travel no more than one-half kilometer from the last guidepost you should dismount and lead your horse by the bridle on foot for your own safety. Follow at all times the most distinctive trail because there are forks and side trails at certain spots. Remember that this part of the route is also used by wandering herds of livestock and that there are usually several alternate paths that arrive at the same place. To ensure that you do not stray from the right path, you can guide yourself by the trail markers, which you should see at no more than 10-minute intervals as you travel along until you finally reach the forested lakeshores of Lake Palena. You can spot Guidepost 35 beside the trail at a few meters distance from the lakeshore, where you will have access to drinking water. This is a small wooded terrace suitable for camping or to take a well-deserved rest before you start out on the return trip. Doubtlessly, the magic and mystery of this little-known lake will pervade us and leave a deep impression on us with its ripping water that is of a clarity you may have never seen before. This lake is fed by water caught by the deciduous forests with their myriad of colors in autumn in this nook of the Patagonian Andes Mountains, which surely you will find hard to forget. Do not try to do the trail at times of heavy precipitation or major thaws of Andean snow and ice. The streamflow on the El Azul River can rise rapidly and make it impossible to cross over to start Section 2 of the trail. due to abundant rainfall and buildup of snowpacks in the mountains. If you wish to stay overnight at family lodging places or campsites, get in touch with the office of tourist information or directly with inhabitants of the village of El Azul before starting out on the trail. Take rainwear and thermal clothing along with you for your safety and comfort. Carefully read this description of the route before starting out on it. Wear high- or low-top boots that are comfortable and safe for use when put into stirrups. Take a map of the route along with you and a watch to keep track of the time. Take along bags to bring back your garbage and trash with you. Enquire at the town of Palena before you start out regarding the conditions of weather, conditions of streamflow and water stage on the El Azul and snowpack accumulations in the cordilleras, all to better plan your trip. Do the trail accompanied by at least one other person and go prepared with all the information you will need. Keep the travel times for each trail section in mind so that nightfall or a change in the weather does not catch you off guard. Do not stray from the trail for any reason. Travel along the marked or indicated route only. Do not ever leave farm gates any other way than the way you found them. No hunting. Do not disturb native fauna. Do not pick any plants or parts of plants that are native flora. No littering. Bring back all of your trash with you. Always put out your fires with copious amounts of water and stir until cold. Do not light fires inside a forest for any reason. Taking good care of our forests now is everybodys responsibility!